An ear infection (also known as otitis media, otitis is the latin for inflammation of the ear, media means middle) occurs when the small section behind the eardrum in the middle ear which is normally filled with air becomes filled with fluid (mucus) and gets infected. The infection is either a bacterial or viral. They can be painful (although not always) because of inflammation and fluid build up. Kids are more prone to ear infections than adults simply because of their anatomy. In children, the eustachian tube is horizontal. In adults, it’s angled more vertically. When the tube is horizontal, it’s harder for fluid to drain so as children grow up, this becomes less of a problem. 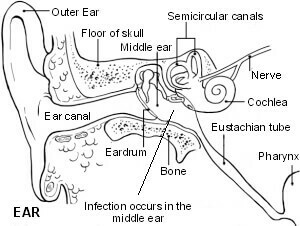 Another common cause for ear infections are respiratory infections, the eustachian tube whose job it is to balance pressure between the middle ear and the outside can swell shut and the fluid that drains through the eustachian tube is not released. So the fluid doesn’t drain and the pressure doesn’t release. This stagnation is a breeding ground for viruses and bacteria, leading to an ear infection. According to the Mayo Clinic, ear infection symptoms common in children include: ear pain, especially when lying down, tugging or pulling at an ear, difficulty sleeping, crying more than usual, acting more irritable than usual, difficulty hearing or responding to sounds, loss of balance, fever of 100 F (38 C) or higher, drainage of fluid from the ear, headache and loss of appetite. I would add to this redness behind the ear which has been our experience. Sometimes, there will be no outward symptoms at all and infection can only be identified with an otoscope. Ava has had 4 infections – 2 double ear infections caused by mucus build-up from severe upper respiratory infections. The third ear infection occurred when she just had a cold. With the first 3, we managed ear them easily and the pain has dissipated almost immediately. As with everything else, timing is important and I start treating right away. Garlic and mullein oil is a staple in my herbal cabinet. This most recent one however, was more resistent and took one whole day for the pain to be completely gone. I had to add some additional tools which I will talk about below. You can make your own garlic oil, and I have 2 friends who did this and treated their daughters’ ear infections successfully. Personally, I don’t want to have to worry about whether I have cloves of garlic in the house and then making it when my kid is pulling at their ear and crying in pain! The first time Ava got a double ear infection when she had Respiratory Synctial Virus (RSV), I would put the garlic drops in her right ear first and then she would run away before I could get to the left ear. I wasn’t thinking #mombrain #RSVisStressCity and the next time I applied the drops a few hours later I would start with the right again. We continued this way and the left ear wasn’t getting any oil but Sherlock Holmes here hadn’t figured that out. When we went back to the chiropractor, the right ear was almost completely better but the left on still had a ways to go! So 2 lessons 1) the garlic/mullein ear oil works! And 2) if your child runs off after just one ear, alternate the ear you start with! I massaged diluted lavender essential oil on the ear lobe, behind the ear and down the lymph on the neck 4 to 6 times a day for ear support. You will often feel swollen lymph nodes when you do this. Make sure you are making downward motions with your hands so you are drawing the infection away from the ear, toward the chest. Never move up the neck toward the ear. When Ava says her ear is bothersome or even itchy, I will put lavender on straight away and apply periodically and usually I never hear about it again! Chiropractic releases pressure on the Eustachian tubes allowing the fluid to drain naturally. My chiropractor checks the ear so we can monitor progress. In the case of Ava’s first ear infection when she had RSV at 2 years old, her pediatrician checked her ears and it was a surprise to hubby and me that she had an angry double ear infection because they did not hurt her at all! Because of this, we would not have had an outward indication of healing so having the chiropractor check it at our visits was so helpful. Remove dairy from the diet. Dairy is mucous producing and causes inflammation in the body. Removing dairy is important during an ear infection and especially for children who suffer from recurrent ear infections. For Ava’s first three ear infections, the pain was gone within minutes and not more than 3 hours although it did take 4-5 days for all signs of infection (seen only with an otoscope) to go away. 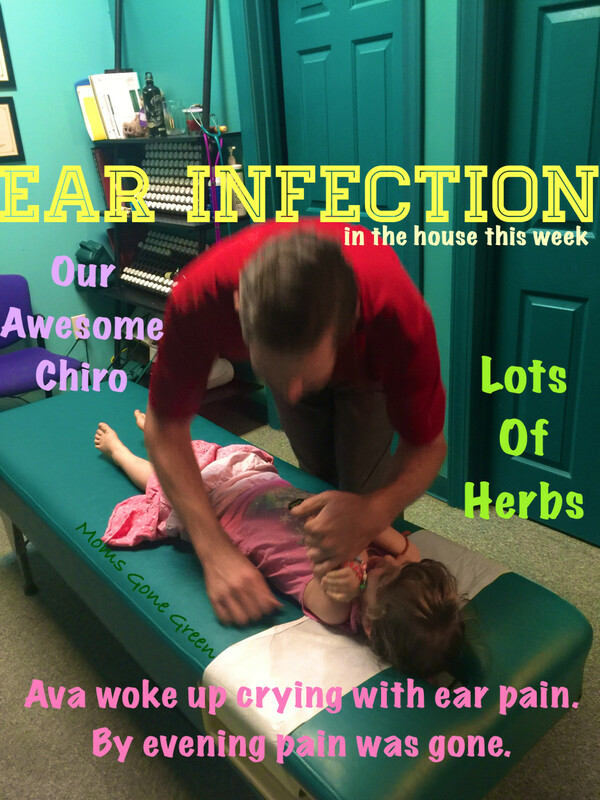 For Ava’s recent ear infection where the pain started when she got up and didn’t completely go away until that evening, in addition to the above (and yes, we did go to the chiropractor), I gave Ava garlic, caprylic acid, echinacea/goldenseal combo and probiotics. I also added thyme and lemon essential oil to get the fluid moving. Even though the pain was present during the day, and waxed and waned, it never got bad. The only time Ava cried was when she woke up with the pain and it got better after that with my potions :). The key with every illness, is to work fast and hard early on, it gets progressively harder to manage infections the more time they have to get entrenched. I still gave Ava herbs and oiled the following day even though the pain had gone and we went to the chiropractor 2 days later for a second adjustment. Our chiropractor had said on the first visit that Ava was very tight in her neck region but much better on the second adjustment. That said, I have helped Moms whose kids had ear infections for some time to clear them up. Cut a slice of onion measuring an inch (preferably organic) and place it over the ear. This will help draw out the infection. If all the above does not resolve your child’s ear infection, Silver Shield should annihilate the infection (1-2 drops in the affected ear 3-5 times a day as needed). The only issue is that you are taking out some of the good flora in the ear canal too. I love the power of Silver Shield, it is another staple in my herbal cabinet. Chronic ear infections can affect your child’s development, speech, balance and cause permanent damage to the middle and inner ear. With chronic infections, bad bacteria has gained traction, chronic ear infections have also been associated with overgrowth of yeast. It is important to address the root cause. If ear infections persist, homeopathy is a good option, the right chosen remedy will reduce frequency and severity of infections. Common homeopathic ear remedies include hepar sulph, pulsatilla, chamomilla, belladonna, and less commonly, aconite. The remedy will be specific to your child’s presentation of the ear infection.